Russian President Vladimir Putin says Moscow is willing to host an international conference on the humanitarian crisis facing Syrian refugees fleeing their war-torn country. 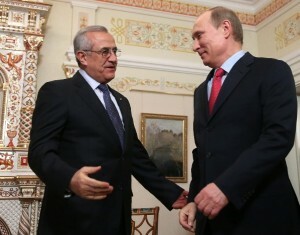 Speaking to his Lebanese counterpart Michel Suleiman in Moscow on Wednesday, Putin pledged to help Beirut deal with the large numbers of refugees pouring over its border with Syria. “We shall work for holding an international conference,” Putin said. “If the countries concerned agree with this, we shall be prepared to suggest Moscow as the venue,” Putin said, according to the ITAR-TASS news agency. Lebanese authorities say there are currently more than 200,000 Syrian refugees in Lebanon. “We will task experts with sizing up the amount of aid needed. It may come in three ways – as financial aid, as a cargo of makeshift houses and tents and as medications to make certain that refugees have adequate living conditions,” Putin said in a statement carried by Russian media. The UN estimates that as many as 100,000 Syrians a month are fleeing the fighting between rebels and government forces loyal to President Bashar Al Assad. The United Nations High Commissioner for Refugees (UNHCR) says the numbers leaving Syria have been “unrelenting” and has warned that the current number of 670,000 in Turkey, Lebanon, Jordan and Iraq could swell to a million in a matter of months. The UN has called for a $1.5 billion fund for what it says is the fastest-deteriorating humanitarian crisis on the planet. UN officials say they have received less than 20 per cent of financial pledges. In the meantime, Putin has said Russia is committed to assisting Lebanon in providing adequate medicines, financial aid and shelter to the Syrian refugees there.